Well, it would turn out to be a lot more challenging than I'd anticipated! The starboard cabin trunk panel in Ravat was badly water damaged from a broken window seal which was left to decay for an extended period of time. The wood had lost its integrity and could no longer support the slight strain of having headliner material glued to it. The good news is, it still had enough form to make a perfect template to cut a replacement. I eyeballed it carelessly and thought it was 0.25" Luan. Mmmmm, nope. The closest thing I could find at the local big box shop was 1/4" birch plywood. Much prettier than what I needed since it was to be covered up, but in the interest of getting it done I picked up a sheet. I cut the template with no problems, laminated the headliner material with 3M adhesive, and thought I'd be good to go. Mmmmm, nope. It turns out that the birch ply was significantly stiffer than the original material, and would pose some serious frustration potential to meet the necessary contour. So, I thought to myself, no problem, let's go for 1/8". On closer inspecton, the thickness was definitely less than 1/4" and with the rolled headliner material it brought the overall thickness up to roughly 1/4". Well, it turns out that 1/8" ply or Luan is also quite challenging to find. A local lumber yard let me know that the only thing they can get is something called bendable plywood (also poplar faced) at $40 per sheet. That's an awfully fancy hunk of wood to cover up with material. And so I went back yet again to the decayed panel to measure it more closely, and without assumptions. It was at this point that I remembered that I have a Canadian boat, and perhaps it used metric products... Ahh ha! Look at that! The paneling thickness appears to be just about exactly 5mm! And so now it's back to the lumber yard to see if they can get me 5mm luan at something closer to $20 per sheet so I can get this project rolling. The next step will be replacing the plastic edge trim. My old stuff is UV damaged, and too stiff to re-seat properly, so it needs to be replaced. It turns out that the original radius of the port is right at the edge of what this trim wants to do, so I'm considering an upgrade to Taco flex trim. This stuff appears to have a more aggressive attachment method and be more flixible. The alternative would be StanPro QuickEdge, which appears to be just about the same stuff originally spec'd on the boat. 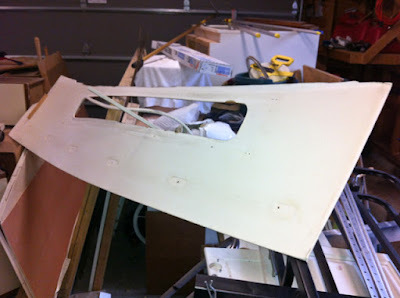 That will get the cabin trunk panels ready for installation, and they are the outboard support for the main ceiling panels. It seems I'm getting very close to having an aesthetically acceptable interior!